This post is an attempt to explore the behavior of gold during each season in the Kondratieff Cycle. For newcomers, let's briefly review Kondratieff Cycle Theory. The Kondratieff wave is about is a study of long cycles of debt buildup and repudiation. It is not exclusively about price inflation and deflation periods. Deflation is caused in part by the debt collapse. It is also a generational thing as the next cycle of debt buildup and collapse is renewed every 2-3 generations as the previous generation that went through comparable periods dies off. Unlike others I do not think each season is fixed length nor do I think that a complete cycle is 54 years, but I am quite sure that we do go through four seasons and the seasons are generally long, from 15-25 years or so each. Those descriptions do not exactly match those from the above link, but the ideas expressed are similar. Given that there are three seasons of positive inflation (disinflation is a positive but falling rate of inflation), by the time Winter approaches no one thinks deflation is remotely possible. In order to make sense of pre-fiat gold prices, it is necessary to work out gold's "real price" from that period especially during deflationary eras. While perusing around for a historical chart that I could use, I stumbled on a chart of the CPI adjusted price of gold on sharelynx.com. The chart looked very familiar to me as a chart of interest rates. I asked Nick at sharelynx if he could take it back to 1920 and overlay the Fed Fund Rate on top of it. It wasn't anything he had tried before but he was happy to oblige. I then took his chart and added a few comments and a rough approximation of K-Cycle seasonality. Here is the result. 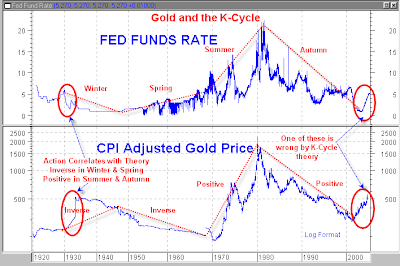 Notice how the purchasing power of gold is inversely related to the Fed Fund Rate in Winter and Spring and directly related to the price of gold in Summer and Autumn. This is exactly as K-Cycle theory would suggest. 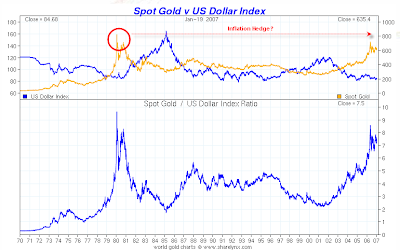 Those that thinks gold always acts as an inflation hedge are simply mistaken. One quick glance at the above chart should be proof enough. Did we experience inflation from 1980 to 2000? Did gold fall from over 800 to 250 anyway? Obviously the answer to both questions is yes, and that disproves the idea that gold is always some sort of inflation hedge. Yet the same statement is made by someone every day. In Autumn, cash is trash and gold (like all currencies) are of little use. Asset prices like stocks and houses soar and everyone is spending every cent they have and then some, as fast as they can. A similar thing happened in the Roaring 20's and probably every other crack-up boom in history as well. In the credit crunch of Winter deflation, gold and currencies are hoarded and the purchasing power of both rises. If anything, the CPI adjusted price as shown above during the Great Depression does not really do justice to the mammoth increase in assets such as land or stocks that gold could buy. Instead it reflects purchasing power on a general basket of goods and services. The same thing is likely to happen again. Note the two red ovals on the first chart on the far right. One of them is wrong. Gold is signaling deflation (at least by K-Cycle theory) but the Fed Funds Rate is not. What the chart does show is the "False Spring" reflation when the Fed acted too soon to prevent K-Winter by slashing interest rates to 1%. All the Fed really accomplished was the creation of an even bigger debt bubble that is going to have to be deflated away. This was the greatest currency experiment the world has ever seen. It will end in failure. Every bubble sows the seeds of its own demise. Wages are not keeping up with ability to service debt. Global wage arbitrage and outsourcing ensures that trend will continue. Housing is not affordable and has risen several standard deviations beyond wage growth and rental costs. People purchased homes they could not afford just because someone was dumb enough to lend them money. The result is rising bankruptcies and foreclosures at a massive annual rate of growth. That liquidation has just now started. The December-January correction in gold appears to be over and a major move higher may have begun. Even though the action from last year’s high in May has been volatile, the index has more-or-less moved sideways over the past year. This consolidation is a long-term bullish sign that suggests there is much more upside to the gold bull market. Notice how the recent decline retraced only part of the rally from last October’s low. This may be the last dip before the HUI breaks out of this sideways consolidation for good. 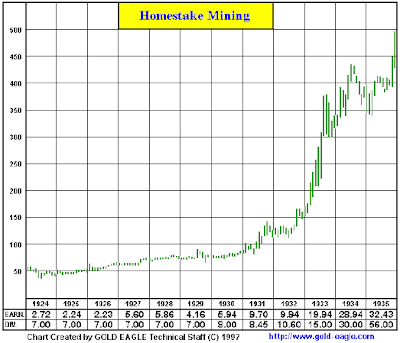 Thanks to Gold Eagle and Sharelynx for the charts in this post.